We have passed the equinox. Spring has sprung – the first chiffchaffs calling their names in the hedgerows, fuzzy drinker moth caterpillars emerging from hibernation, and frog spawn in great clumps in the wet slacks in the duneland beyond the Straight Lonnen. We have seen large flocks of whooper swans flying in great loops above Holy Island, white shapes against grey clouds – perhaps orienting themselves for their spring migration back to Iceland. The geese, too, are on the move. 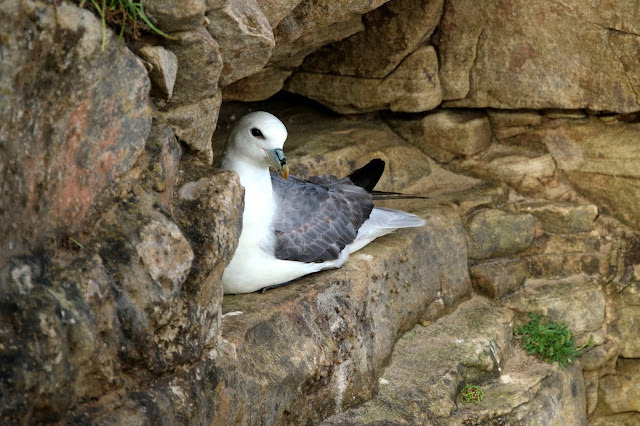 Ground-nesting birds such as skylark and meadow pipit are beginning to form territories and fulmars have returned to the rocky ledges of the Reserve’s only sea cliff. This month has seen the last scrub bashes of the season, with teams of staff and volunteers setting to with secateurs and loppers, and pitting our weight against the roots of the willow scrub on the Snook. 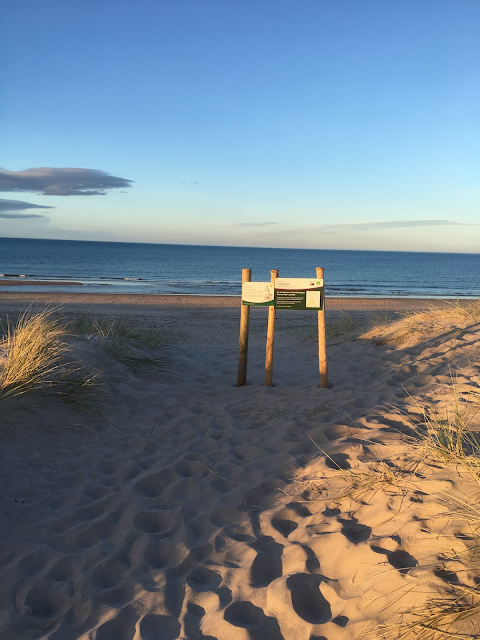 We have been continuing to clean the Reserve’s beaches and duneland of litter, trundling a wheelbarrow across the dunes to collect bulky items from the North Shore. In the Rocket field, we are at the start of a project working with Jimmy to improve conditions for overwintering and breeding birds. Good numbers of teal and oystercatcher have been present there over the winter period, as well as lots of roosting gulls. Shorebird season will soon be upon us – sandwich terns have already been seen in the south of England, and from the end of April onwards we will close off sections of beach across the Reserve to provide refuge areas for little terns and ringed plover to nest in without human or dog disturbance. Both species are under threat and breeding success is in decline. We are looking for volunteers to help us with our conservation efforts, to assist with shorebird monitoring and public engagement. Lindisfarne NNR are spearheading a Northumberland census of ringed plover and are seeking volunteers to regularly check sections of coastline to help us to monitor their numbers and breeding success. Please contact Lead Shorebird Warden Katherine Dunsford at k.dunsford94@gmail.com if you are interested in volunteering. Finally, we are in the process of appointing new seasonal shorebird wardens, and a new Reserve Manager, to help us to care for the species and habitats of this spectacular place. I began my time on Lindisfarne National Nature Reserve on placement as Shorebird Warden. I was offered a placement as it was my first season working on the Breeding Shorebirds Protection Scheme and it was the perfect opportunity to gain experience from the wardens about how to successfully protect and monitor the birds, as well as how to engage with members of the public and encourage them to support the need to conserve rare and declining shorebirds. Building on the knowledge I gained during the 2017 season, the following year I was offered a traineeship by Natural England and Coast Care as Shorebird Warden and Engagement Officer based at Lindisfarne NNR. This was a huge step up from the previous season, as I was given the responsibility of creating rotas for staff and volunteers, as well as training new volunteers and ensuring they were supported during the season. Due to the resignation of a contract Shorebird Warden, I spent a large amount of time at one of the main breeding areas on the Reserve than first expected. Everything was going well for the birds – lovely warm weather and constant protection from disturbance and predators – until Storm Hector hit in mid-June. Despite valiant efforts from the wardens, many of the Little Tern nests failed. However, the Storm was a blip in the glorious sunshine, and favourable conditions made it possible for those birds to re-lay. In 2018 the Reserve was the most important site for both Little Terns and Ringed Plovers in the North East and I would like to think I played my own little part in contributing to this success. We are now fast approaching the 2019 Shorebird Breeding Season, and Ringed Plovers are already forming territories around the Reserve. I am lucky enough to be back on Lindisfarne NNR this year, taking on the role as Lead Shorebird Warden: supporting the recruitment and training of staff and volunteers, coordinating daily data collection and working closely with partners to get a better understanding of the numbers of Little Terns and Ringed Plovers breeding on the Northumberland Coast. We are hoping that our birds will do just as well, if not better this coming year! In addition to the Shorebird Protection Scheme, this year we are building on the successes of a Ringed Plover survey done by staff and volunteers at Lindisfarne and the Long Nanny during previous seasons to gain a deeper understanding of the numbers of these little birds breeding on the Northumberland coast. We are hoping to work alongside the National Trust and the Northumberland Coast AONB to do this, as we need volunteers up and down the coast to monitor and map Ringed Plover territories. If you are interested in getting involved in either project, there will be an information session at the Coast Care Hut in Seahouses on Monday 1st April at 2pm. Alternatively please call the Lindisfarne NNR office on 01289 381470 for more information. Firstly the weather conditions along the Sands of driving wind and rain, swirling sand and temperatures in the low single figures, made for quite a challenging experience. Undeterred a group of eleven stoic volunteers ventured out along the coastline determined to complete the task in hand. Our only observers: a few curious Grey Seals following us along the coast. What must they have been thinking? Four hours later and still smiling we had managed to dig out and recover seven lobster pots, a good haul of rope and rags, a discarded 20 litre container and an old boot along with approximately five Ikea bags of rubbish. Many thanks to all who ventured out into the wind and rain to help care for the Reserve. 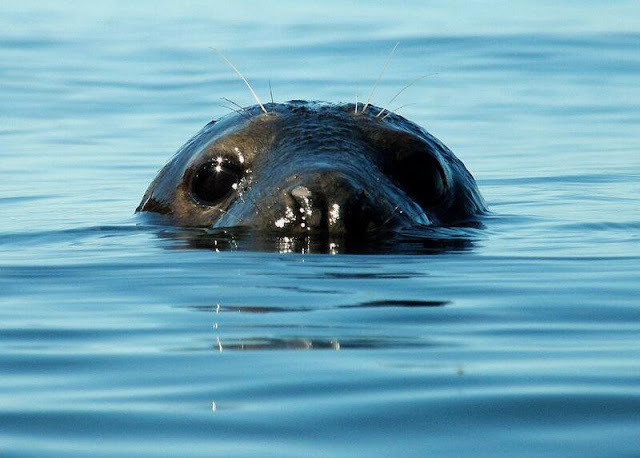 You have our (Grey) Seal of Approval! Prompted by International Women's Day, we sat down to chat to some of the Reserve's team. 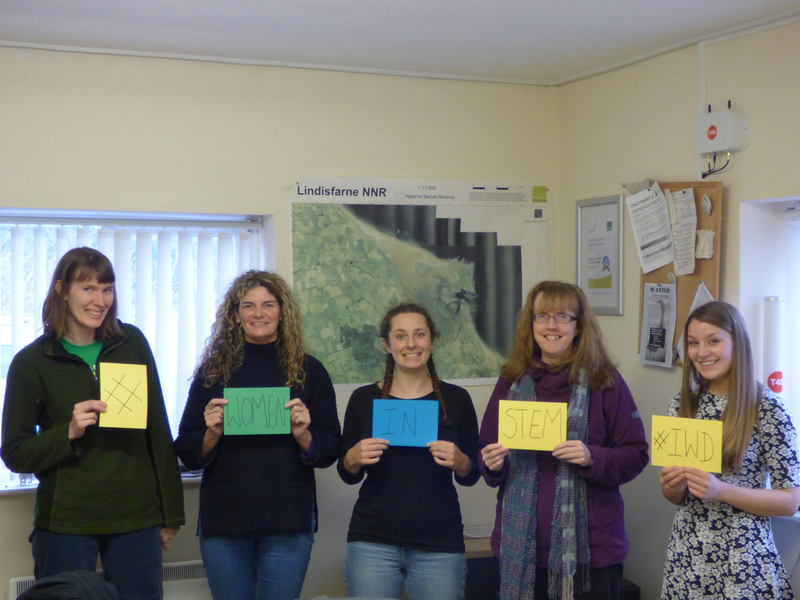 In recent years, numbers of women in science and conservation have hugely increased and women work in a number of roles in Natural England and at Lindisfarne NNR. We spoke to Lucy May, Catherine Scott, Elaine Young, Katherine Dunsford and Ceris Aston about what made them love science. Lucy: I am a Marine Lead Advisor, Responsible Officer for Lindisfarne SSSI. Catherine: I am the local fisheries lead and monitoring and evidence lead, so I get to come to Lindisfarne because it is a multidesignated site and a jewel on the north east coast which needs to be protected for future generations. 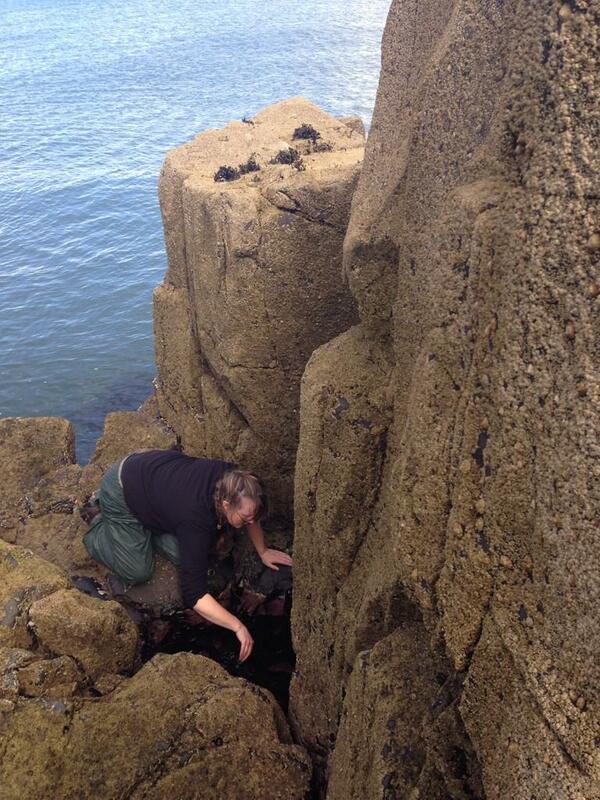 Elaine: My role is Senior Marine Advisor, so I oversee the delivery of all the marine work in Northumbria. Katherine: I am the Reserve’s Winter Warden, surveying non-native species on the Reserve and leading volunteer and school events. Ceris: I’m an apprentice – so a bit of everything, with a mixture of admin, habitat management, events and outreach, and biological monitoring. What first inspired a love of science/ conservation? I then moved on to bigger things. Catherine: Rockpooling with my dad from ages 2 - current. There was always something new and magic- every rock was like Christmas; you turn over a boulder and it’s like a Christmas present. Elaine: For me it was through my passion for travelling – the more I travelled the more I realised my passion for science and conservation, which inspired me to follow a career in conservation. Katherine: I grew up on the Northumberland coast and spent a lot of my childhood on the beach. It made me fall in love with the coast. Ceris: I did a project on Scottish Wildlife when I was about nine… where all my classmates submitted about ten pages, I handed in a bulky folder. I did my research! Lucy: I did Conservation, Biology and Ecology at Exeter University in Cornwall, then had a beach bum life for a few years, then went to Bangor and did Marine Biology. 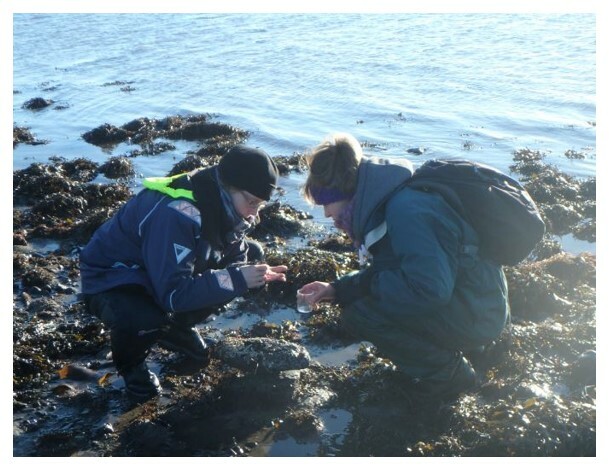 Catherine: HND in Applied Biology, then a BSc in Marine Biology, and then a PhD in Marine Ecology focusing on Arctic Marine Ecosystems and the population community ecology between the ice system and the pelagic system. 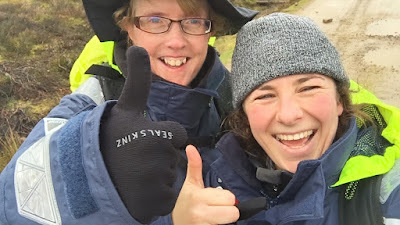 Elaine: I have an MSc in Environmental Management from Stirling University – I thought at the time Marine was too focused and was looking at the bigger picture. Katherine: A BSc in Marine Biology and Oceanography. Ceris: A bit different… I did an MA in Liberal Arts (Philosophy). After several years in journalism, publishing and the women’s sector I changed career. I've almost completed my Level 2 Certificate and Diploma in Environmental Conservation. What do love most about your job? Lucy: I love the fact that every day is different and I get to work outside. And I like diving – it’s as close as you can get to being a fish. Catherine: The people and being outside, categorically. Elaine: I feel really lucky because it’s so varied and it is obviously something that I am passionate about. I feel like I can really make a difference. Katherine: I love how varied it is. I get to be outside and constantly learn new things. Ceris: I love being outside and learning, and feeling as though I can make a bit of a difference in protecting the natural world. It feels as though February has only just begun, but the shortest month is drawing already to an end. It has been a busy month and the team have been working hard to complete habitat management tasks on the Reserve. In the dunes on the Snook we have been tackling scrub – hand pulling and cutting hawthorn to maintain duneland habitats for flora and fauna. Larger hawthorn shrubs are kept due to their importance for passerine birds. We have also been continuing to remove sheep droppings from the grazed dune slacks, in order to create nutrient-poor habitats in which orchids will thrive. It feels like spring is already upon us. The mild weather has seen amphibians emerge - on the wet slack near the Snook we spotted a large Common Frog with golden rimmed eyes and a palpitating throat. Fluttering skylarks are singing in the dunes. At the Lough, Mallards are pairing up. These distinctive birds are early breeders amongst ducks. We tested people’s duck knowledge at a ‘Love Birds’ event last week, challenging children and adults alike to pair up images of some of the Reserve’s duck species. Mallards and Eider provided no difficulties, Teal and Shoveller baffled some, whilst the brightly coloured Shelduck surprised those who believed all female ducks to be brown and subdued in colour. 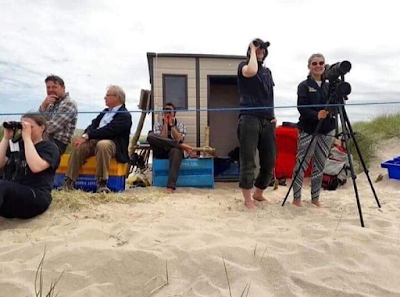 The event launched our year’s events programme which seeks to engage the interest of locals and visitors alike in our natural world and the spectacular wildlife and habitats of the Reserve. Events range from rocky shore rambles to recycling events, from beach cleans to bird watches. We have been continuing non-native species monitoring and removal, moving from the terrestrial to the marine environment. We have been surveying the Reserve’s rocky shore, a fascinating and diverse habitat which is currently under threat from small alien invaders, who hitched lifts on ships from the southern hemisphere. These aliens are Orange-Tipped Sea Squirt, small creatures resembling Werther’s Originals or small lumps of orange-tinted jelly. They live on the bottom of rocks and compete with other sessile (non-moving) species for space, a valuable commodity on the rocky shore, and for food. Monitoring and removal of the species is ongoing. 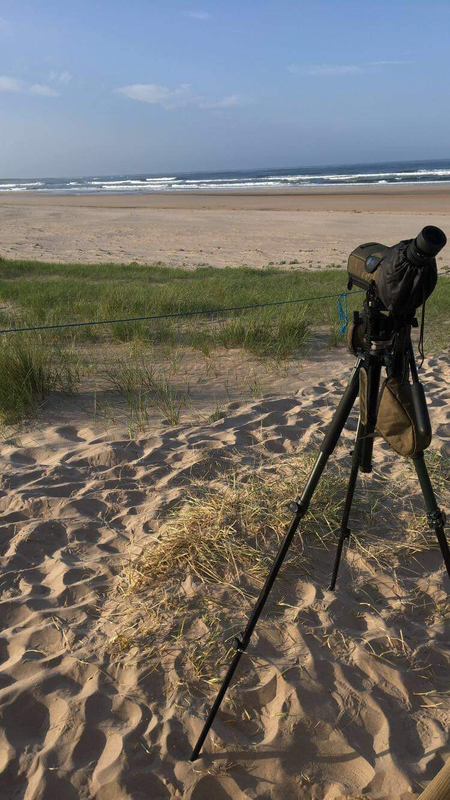 We are busy too preparing for shorebird season – it is not so long until the end of April, when the rare Little Terns will return to breed on Northumberland’s sandy beaches. Charismatic Ringed Plover are already starting to establish breeding territories across the Reserve. Peak counts of birds on the Reserve include 1000 Bar-tailed Godwits on the high tide roost at St. Cuthbert’s Island, 223 Pintail on Fenham Flats and 1000 light-bellied Brent geese south of Fenham Flats on the 17th Feb, 6500 Pink-footed geese on the Reserve on the 1st and 950 Barnacle geese recorded during a low-tide count on the 10th February.